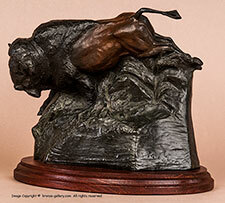 Ed Fraughton was born in 1939 in Park City, Utah and is best known as a contemporary American Western sculptor. He began with studying engineering but changed his focus to sculpture in 1962 and studied under Dr. Avard Fairbanks and his son Justin. After a few years with the Job Corps program, he became a full time sculptor in 1967 and earned several Mormon theme commissions. 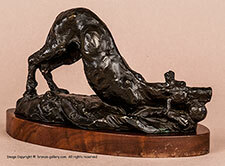 In 1973 he won the National Academy of Western Art Gold Medal, followed by awards from the National Sculpture Society, the National Academy of Design, Society of Animal Artists, and many others. His work is represented in many museum collections and he is well known for his portrayals of pioneer life and of Native Americans, as well as wildlife and equine subjects.